Inspired by writer Nikita Marwaha’s essay "The Beauty of Being British Asian", you can expect to see how 15 multimedia and five spoken word artists interpret both identities. 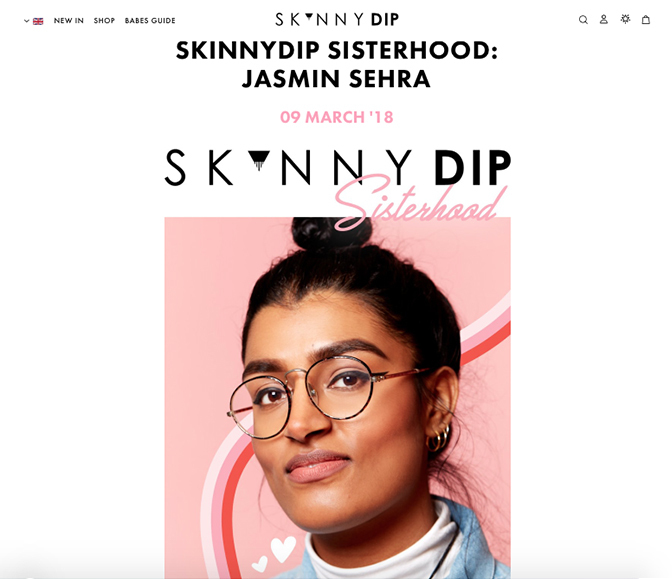 Each has selected a line that best fits their take on juggling their south Asian values with their British upbringing, from photographer Dejah Naya McCombe’s "Punjabi Skinhead" portraits to visual artist Jasmin Sehra’s "BollyHood" series fusing her Punjabi heritage with her love of hip-hop. Campaign celebrating diverse female creatives within the creativity industry. A collaboration with Skinny Dip x The Other Box. Jasmin Sehra pays homage to pioneers of hip-hop by artistically reimagining them in the stylized aesthetic of Indian film posters. A series of paintings she’s dubbed ‘Bolly-Hood’. It’s hybridity at its finest, urban culture within a Bollywood framework; a visual ode to the East and West. Kendrick Lamar, Queen Latifah and M.I.A vibrate with colour and cultural significance. Meanwhile Drake and his collaborators against a floral backdrop capture the essence of More Life’s far-reaching rhythms.